I have been wearing too much black lately. What can I say, I love how black gives me the darker vibe and more stylish look. However, If you just wear all plain black -let's be honest- It could get a little boring. That is why sometimes accessories are important to 'spice' things up. In this outfit, I wore an oversized grey coloured bow over a black dress, and I think that what makes my outfit even more catchy despite the wide hat. I was wearing my Proenza Schouler bag in green and blue colour to add a bit of colour to my outfit. Oh and lastly, did you guys notice the nice lace on the sides of my dress? 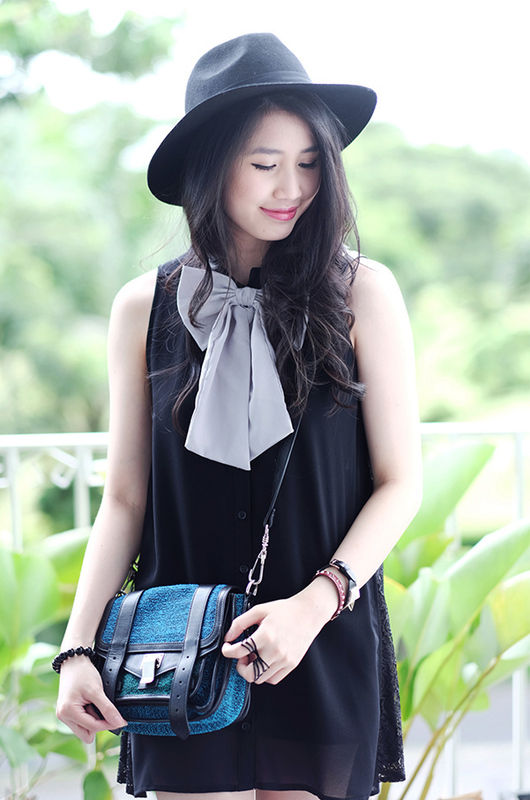 Love the bow tie detail and your accessories :) cute outfit! So cute! I love the side lace details. Your look has totally inspired me ! I absolutely love this look! Where did you find the bow? It is the perfect detail for this dress! Anyway, I love your blog and am so happy to be a new follower!